When it comes to manufacturing and supplying high quality Tyre Cutter knives and blades, we are counted among the best. The tyre cutter knives and blades brought forth by us is meant to cut various kinds of automobiles tyre materials like turck tyre, bus tyre and different types of tyre. Our tyre cutter blade is innovatively designed to offer maximum output with high precision. These blades have fine edge with durable life. They can be availed at the most discounted rates in comparison to the ordinary market. 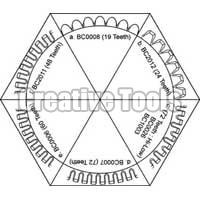 Besides, we are one of the most reputed Tyre cutter knives Exporters in India. 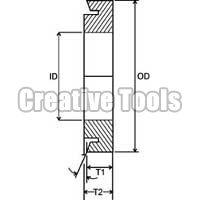 Standard : Bottom Shear Knives / Female Knives with Plain Bore. Applications : Specially used in manufacturing Automobile Tyres, Truck tyres, etc. for cutting Rubber Sheets. Note : Typical Teeth Profile of various Bias Knives. 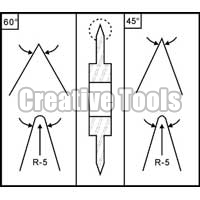 Applications : Generally used for slitting/scoring the fabric in tyre industries. Also used in paper converting, Film slitting and many other application. Suitable for machines like Cameron/Arrow/Ashton/Dusenbery/Johnstone & Others. Other Accessories : Pneumatic holder also available for score slitters. Send your sample or sketch. Material : SAE 52100/ AISI D2. Also available in HSS. Note : Various Slitters/Scorers/Crushers with cutting Angles & degree.